Hampden Gurney Primary School is the latest organisation to benefit from our Community Programme, which brought a team of 36 Community Champions from a local business to maintain and repair areas of the school’s roof garden, changing rooms and help to serve lunch. The school is unique in its design as it incorporates outdoor, covered play decks and gardens on each floor of the building as opposed to a traditional playground. The roof space offers fantastic views and the potential to be an oasis from the bustle of school and nearby Edgware Road. However, the wooden furniture was tired, splintered and in need of a spruce-up for the summer. Between them, the group of volunteers sanded and varnished the picnic tables, bench seating, doors and edging creating a much more cared for space for the children to visit and for the school’s gardening club to enjoy. It was a great opportunity for the volunteering colleagues as they tapped into their competitive sides, vying for the title of ‘Super Sander’ and ‘Victorious Varnisher’! 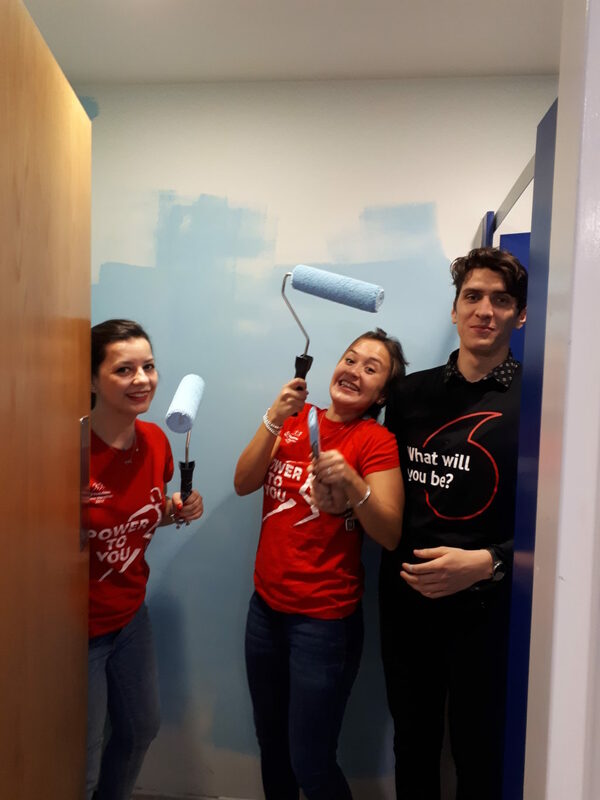 A sub-team spent the afternoon several floors below in the school changing rooms – at one point three colleagues managing to squeeze themselves into one toilet cubicle; determined to ensure they finished their painting challenge. The once cream walls were repainted shades of blue and purple, finishing work that had been started by another corporate team at the end of last year. 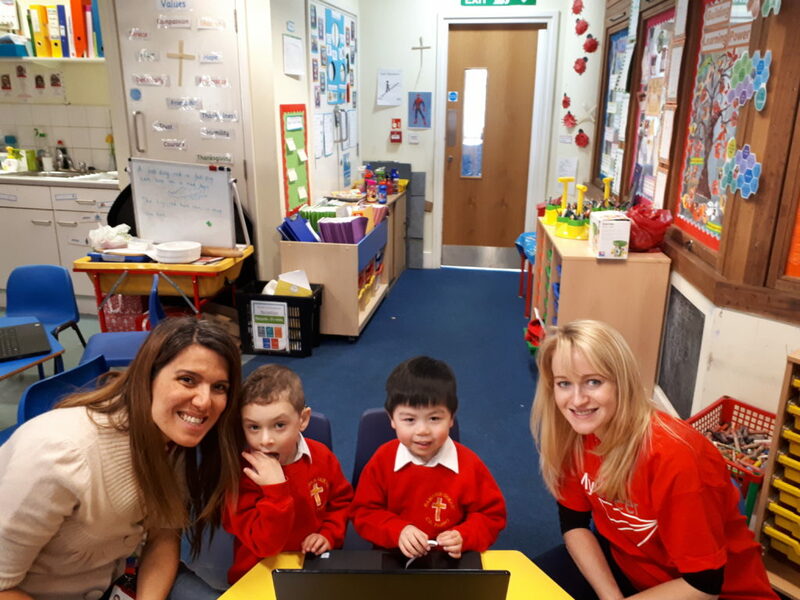 Two soon to be new mums in the volunteer group donned hair nets and aprons and helped serve lunch to the junior school children, before having an afternoon in Reception. Both commented on the appreciation this gave them for the challenges teachers face and an eye-opening insight into another profession. 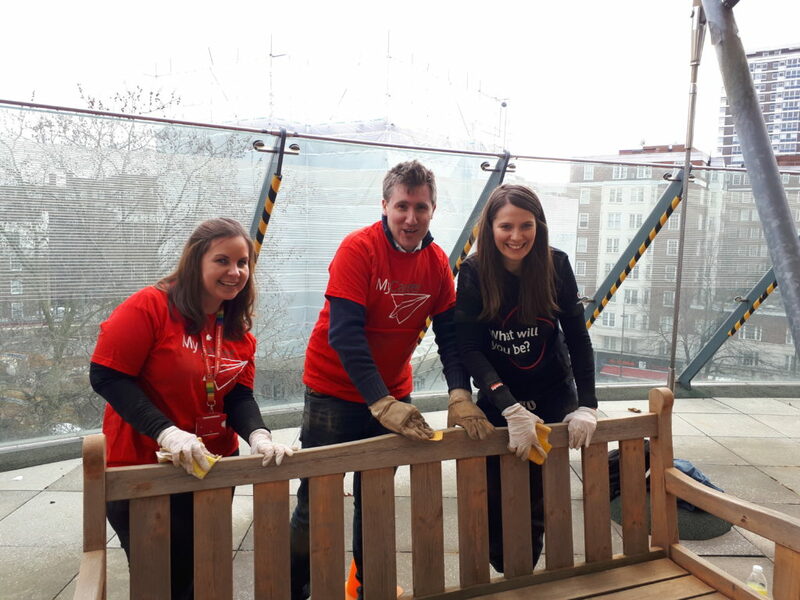 The Marble Arch London BID Community Programme works with a number of schools and local charities who require large volunteer teams for practical projects. If you fancy rolling up your sleeves, picking up a paint brush and getting messy; contact our Community Programme Manager, Emily for more details.